bitter sweet stamping: VMAA Challenge #4 - 3 of a kind! VMAA Challenge #4 - 3 of a kind! Last one - whew! Can you tell what I was thinking about?? I have to give a shot out to Kristina Werner for inspiring this lay out! It was the first thing that came to mind for the 3 of something challenge over at VMAA! Have you been playing along? You have until tomorrow to get your cards uploaded somewhere and the links posted at the A Muse Addicts Forum! Details: Stamps, paper by A Muse, colored with Copics, Spicas and some quickie glue pen! We all need a margarita now!! Love your card! mmmm, now that looks like a delicious card!! LOVE everything about this! I can't believe how quick you made it!! We were on the same wavelength! 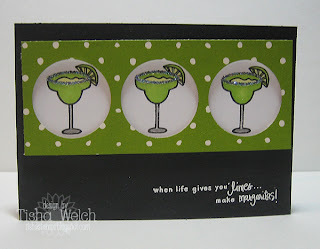 Cute margarita card, I like the circles! Awesome! I could have used one of these after the challenges! GOT MARGARITA?! I love this card!!!!! Oh my goodness!! I LOVE this Tisha!! It is perfect!! Thanks for doing this challenge!! VMAA Challenge #3 - Sketch it, Baby! VMMA - You da' man!! You can take 'em with you!